The Japanese attack on Pearl Harbor changed the lives of millions of Americans. 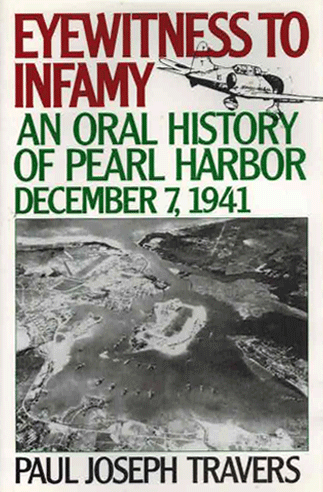 Yet in the long and steady stream of literature about the “day of infamy”, historians have neglected the compelling and moving accounts of surviving military personnel and civilians who were on Oahu at the time of the air attack. Eyewitness to Infamy is their story – the astonishing oral history of the brutal attack on Pearl Harbor, 7 December 1941. With the help of the Pearl Harbor Survivors’ Association, the Veterans of Foreign Wars, and the American Legion, author Paul J. Travers collected over 200 eyewitness accounts from which he painstakingly selected those critical to his behind-the-scenes narrative account. With breathtaking clarity, the narratives cover the full range of military activity on the island, along battleship row and around the harbor, while portraying the human side of the event – the heroic, the tragic, and the terrible reality of the assault.